Blueberries, oh how I love them, fresh picked or frozen. Personally, I buy organic blueberries because of possible pesticide residue, and they are reasonably priced if purchased frozen. One cup of blueberries contain only about 84 calories. They are loaded with vitamins A, C and K and they also have significant amounts of potassium and water. 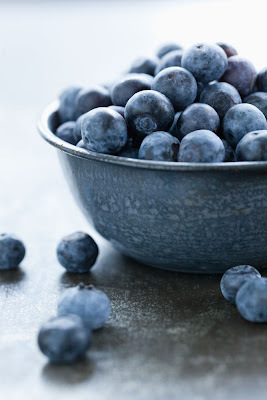 Blueberries are also a good source of fiber which our bodies need to prevent constipation and maintain bowel integrity. This little berry contains loads of antioxidants, more than most other fruits or vegetables. One of these antioxidants is anthocyanin. Studies suggest that anthocyanin may help prevent cardiovascular disease. What else can antioxidants do? They may protect us from free radical damage to cells and tissue. Blueberries contain compounds that promote urinary tract health by preventing bacteria from adhering to the lining of your bladder and urethra. Also, blueberries are high in anthocyanosides. Studies have found that anthocyanosides may slow down vision loss and may delay some age related eye problems such as cataracts, glaucoma and macular degeneration. So, if you are looking for a fruit that’s delicious and beneficial for good health, you’ve just found it!